This year in Guyana, Emancipation Day—the day which commemorates the abolition of slavery—was not a cause of celebration but was marked instead by widespread sadness and anger. 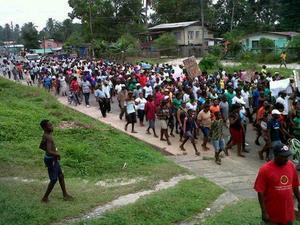 On August 1, funerals were held for three men who were killed by Guyanese security forces during a protest over government plans to increase electricity rates in the bauxite mining town of Linden. "Photo Credit: Global Women's Strike"
Almost two weeks earlier, on July 18, the men were part of a large, ongoing protest calling for Guyanese President Donald Ramotar to reverse his decision to increase electricity rates in the community. Opposition to the issue of increased electricity tariffs is not something new in Linden—as former President Bharrat Jagdeo tried to implement similar reforms in July 2008 but eventually backed down due to widespread community opposition.